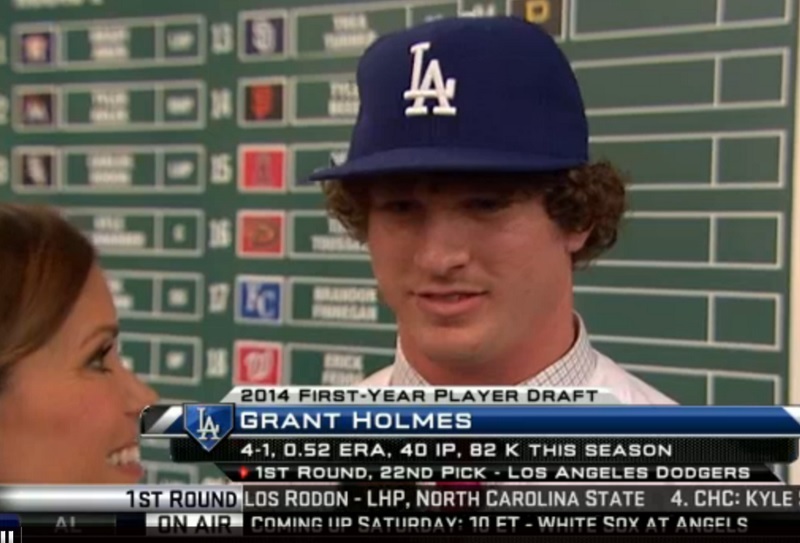 The Dodgers broke their streak of not drafting prep pitchers by taking Grant Holmes with the 22nd pick in the 2014 MLB Draft. This is quite the get for the Dodgers this late in the first round. The last time the Dodgers drafted a high school pitcher in the first round was Zach Lee in 2010. Holmes, from Conway High School in South Carolina, was a consensus Top 15 talent in the draft, but fell to the Dodgers for unspecified reasons. It was an easy selection for them to make, considering a guy like Touki Toussaint went to the Diamondbacks at No. 16 (ugh). The Dodgers have a strong scouting presence in the Carolinas, as they popped Corey Seager from North Carolina two years ago. Holmes has a legitimate mid-90s fastball that touched 100 MPH in the past. It even hit the mid-90s late in outings and has plus-life. It definitely grades out as a plus-pitch down the road. He has one of, if not the best, high school curveball in the draft. It’s a true hammer that sits in the low-80s. It can easily be mistaken for a slider. It’ll be a big swing-and-miss pitch for him going forward. Holmes also has a changeup that has flashed average in the past. That will need to be refined for him to remain in the rotation, but the 18-year-old has plenty of time to work on that. His delivery needs a little work, as he finishes a more upright than I’d like to see. But everything else really reminds me of a more athletic Chad Billingsley. He doesn’t have the bigger lower-half that Billingsley does, but he has a similar delivery and arsenal (stay away from the cutter!). Holmes is also in the mold of former Dodger first-rounders Chris Withrow, Ethan Martin and, to a (much) lesser extent, Lee. Holmes is committed to the University of Florida, but this is a full-slot selection by the Dodgers, so he’ll likely take the $1,980,500 payday to become a Dodgers. Before even throwing a pitch in the majors, I’d rank Holmes as the Dodgers’ No. 8 prospect, and that could increase by the time I do my midseason rankings. I’d give him a No. 2 ceiling, but he’ll probably be a middle-of-the-rotation starter. At worst, he’s a power reliever in the mold of Withrow. He should begin his professional career at Rookie League Arizona or in the Pioneer League with Ogden. 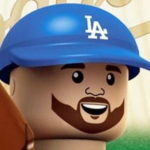 The Dodgers have been known to be aggressive with their advanced prep pitchers. You can listen to Jared Massey and I talk about the pick on the Dugout Blues podcast. Oh, and Holmes has at least 70-present/80-future hair. Just a great pick all-around. Previous 2014 MLB Draft open thread: Tyler Kolek at 2?